Of all the policies of the Israeli occupation of the West Bank, home demolitions are one of the most disturbing. Since the year 2000, almost four thousand Palestinian homes, farm structures and other buildings were wrecked. These were “administrative demolitions,” having nothing to do with security or war. Last year, over one-thousand men, women and children were made homeless when their homes were destroyed along with most of their belongings. These demolitions occur without prior notice. There is just a knock on the door, sometimes even in the middle of the night as happened in the village of Anata last winter. The soldiers and bulldozers are outside, and the residents are ordered to evacuate immediately. Sometimes they are given a few minutes to grab whatever belongings they can. Sometimes they are prevented from doing so. Whatever is left behind is destroyed, buried under the rubble. West Bank Palestinian house before it was demolished. See below for after demolition. The result is a total loss of the most important asset the family has. Most of these families are poor to begin with. The demolition completes their impoverishment, leading to a psychological trauma with lasting physical and mental health impacts. 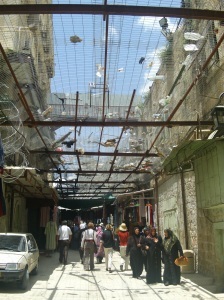 And to add insult to injury, they often are fined tens of thousands of shekels to pay for the cost of the demolition. West Bank house pictured above after it was destroyed. This destruction occurs because Palestinians have constructed or renovated their homes, farms, and businesses without obtaining building permits. The catch-22 they face is that it is almost impossible for them to obtain building permits. Some readers may find this information troubling. Which brings up the question of why I am writing about this material at all. My hope is that readers will forward this information on so as to inform as many others as possible about these practices. This is how pressure can be brought to bear on American and Israeli government and community leaders to take action to change these practices. The West Bank is divided into three areas. Area A: 18% of the West Bank land. Under the complete control of the Palestinian Authority. Area B: 21% of the land. Under joint Israeli-Palestinian control. Israel and the Palestinian Authority jointly control the security and law enforcement in this area while the Palestinian Authority controls certain administrative functions. Area C: 61% of the land. Under the complete control of Israel. In addition there is East Jerusalem, the eastern half of the city that was conquered by Israel during the 1967 Six-Day War. This, along with 28 nearby Palestinian villages, was annexed into the Jerusalem municipality immediately after the war, becoming part of Israel. Palestinian administered Areas A and B are divided among 200 separate communities, the vast majority of which are less than one square mile in size. All of these areas are separated by Israeli controlled Area C land. Thus the parts of the West Bank controlled by the Palestinian Authority are fragmented, discontinuous enclaves that inhibit effective governance and economic development. The map looks like Swiss cheese. Most of the vacant land near communities that would normally be used for the natural expansion of villages is designated as Area C, unavailable to the Palestinian residents living right next to it. Map of the West Bank showing Palestinian administered Areas A & B (beige color) and Israeli controlled Area C (Brown color). 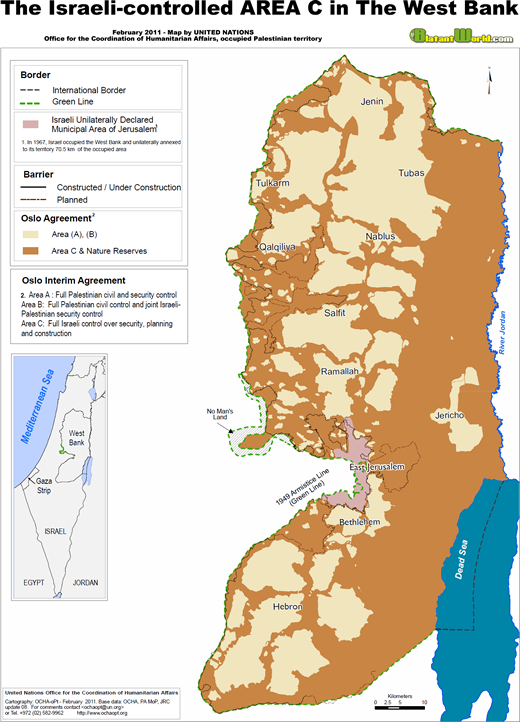 Notice how Palestinian controlled areas are isolated, discontinuous enclaves. Israeli policies prohibit Palestinians from building in Area C. New construction must conform to the master development plans that are produced by Israeli authorities. Unfortunately, Palestinian communities have been left out of the master plans so Palestinian construction is permitted in just 1% of Area C.
In East Jerusalem, the situation is slightly better. Palestinians are allowed to build on 13% of the land. However, that land is already densely populated with little room for new construction. Plus, although technically they are allowed to apply for a building permit, bureaucratic procedures are onerous, expensive, and entail lengthy delays (sometimes years). 94% of building permit applications in Area C and East Jerusalem have been rejected in recent years. The result is that housing becomes overcrowded and unlivable as families grow, businesses cannot expand, and Palestinian villages cannot legally build even essential infrastructure to meet their communities’ basic needs. 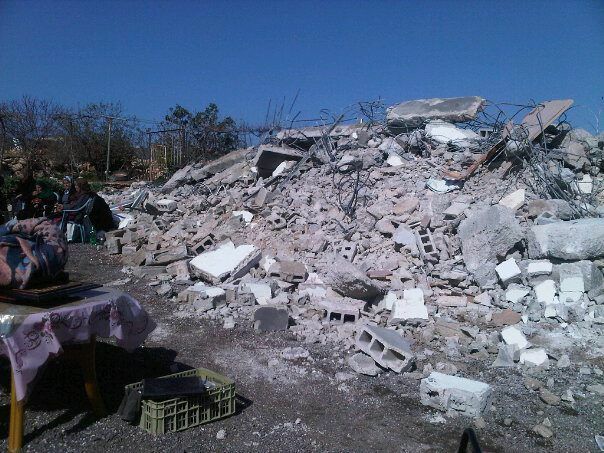 Demolitions occur because Palestinians build or renovate existing structures without building permits. Even major repairs, such as replacing an old leaky roof, requires a building permit. For individual Palestinians, the choice they face is to give up their homes and move to Area A, or to build and take the chance they will avoid demolition. Most choose the latter because they don’t want to leave their homes within a close-knit community of social and family ties. Ruins of West Bank house demolished in 2012. In addition to Palestinians, 510,000 Jewish Israelis live beyond the Green Line, the former Israeli border before the 1967 Six-Day War. Of these, about 200,000 live in large and rapidly expanding Jewish neighborhoods that ring the outskirts of East Jerusalem, creating a barrier between Palestinian neighborhoods and the rest of the West Bank. See a previous blog post to visualize this better. The remaining 310,000 Jewish settlers live in Area C in 250 Jewish settlements, of which about 100 were illegally built according to Israeli law. Large numbers of additional illegal housing units each year are constructed without building permits on Palestinian claimed land. Despite their being illegal, the government connects them to the electric grid and water system, builds access roads, provides army protection, and residents enjoy all the benefits of Israeli citizenship. The neighboring Palestinians in Area C have few of these benefits and are governed under a separate military and judicial system. This year through April 17, the United Nations reported 209 structures were destroyed – 25 were demolished just last week – making 418 people homeless (click here to download the latest weekly report of demolitions, plus political-related violence and injuries, in the West Bank). Here is a recent example of a home demolition described in the April 16th edition of Haaretz. It took 40 minutes to demolish Khabis’s home. He is a poor farm worker tending groves of date palms. After the demolition, the Red Cross provided his family with a small plastic tent. Other than that, they were left on their own. The Jewish reporter who wrote this story described Khabis’s 13 year-old son looking at her with intense hatred since she belonged to the people who destroyed his life. The pace of demolitions is rapidly increasing. In 2009, 275 structures were demolished, including 116 homes. In 2011, the number doubled to 622 structures demolished, including 222 homes. Human rights organizations allege that home demolitions are just one piece of a larger strategy to force all Palestinians out of Area C to the isolated, urban cantonments in Area A controlled by the Palestinian Authority or to leave the West Bank entirely. This would make room for the uninhibited expansion of Jewish settlements where construction continues at a rapid pace. 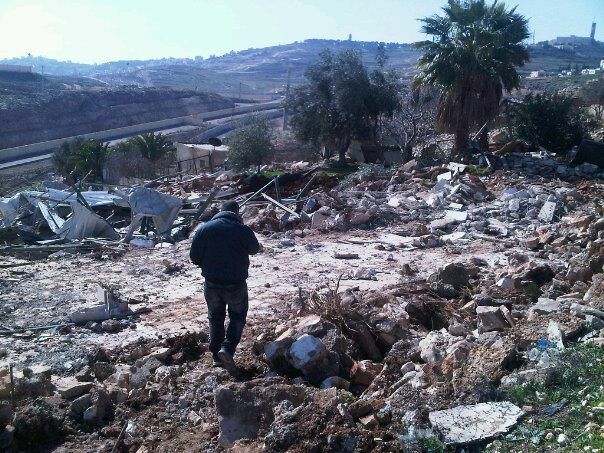 In many cases, home demolitions occur within sight of construction in Jewish settlements – Click here to see a video of an example. Thousands of Palestinian homes are issued demolition orders. However, it can take years, even decades, before they are actually demolished. This leads to a life of prolonged stress and uncertainty, culminating in a traumatic event when the army and bulldozers show up without advance notice. Demolitions lead to prolonged homelessness or moving away. Those with large enough social networks often break up their families by dispersing members among far-flung relatives and friends for long periods. This leads to psychological and physical health issues for the children and parents, affects school performance, and destroys the family’s integrity. The devastating financial loss of the physical home and their belongings can never be recovered. Click the links below to watch two short videos about demolitions. A widespread perception is that houses are demolished because terrorist suspects or wanted persons were living there. The objective is to create a deterrent. In fact, after 1,500 homes were destroyed for this reason since 1983, the army stopped these demolitions in 2005 because they concluded the strategy was ineffective. Besides destroying the lives of thousands of people, without trial and without proving culpability (many families did not realize someone living with them was involved with terrorism or that the person was wanted for other non-violent opposition activities), these demolitions also were a form of collective punishment which is prohibited by international law. Since it is the human element that makes the policy of home demolitions so unsettling, I will end with a narrative about Manal, a pregnant woman with five children who was renting an apartment in East Jerusalem near her parents. Her story includes many typical characteristics of demolitions. …The family had to move back in with Manal’s parents. “It was very crowded,” she says, “and my husband didn‘t want to come and visit us there because there was no space. Me and my daughters slept in one room, the living room. It was very difficult. My children’s school performance suffered – they couldn’t study because there was no space and too much noise with so many people. The only person working in the house was my brother who supported us all,” says Manal. This column was previously published on The Times of Israel. At eight o’clock last night, shortly before my wife and I left our apartment, the sirens sounded for a full minute, marking the start of Yom Hazikaron (Memorial Day), the day when Israelis remember those who have died in their many wars. As we headed down Geula Street toward the beach, passing by the low apartment houses lining the road and then went north on the seaside promenade, the moon was just a sliver seen through a hazy night. We walked into the slight breeze, a touch of cool in the damp air, the sea invisible except for the small white caps of the Mediterranean waves. In about thirty minutes we reached the old Tel Aviv port area, now renovated into a tourist mecca of shops and cafes, but tonight all was closed, deserted, locked up tight like the rest of the city. A few lone souls and couples strolled the boardwalk, trying to avoid the spray right along the seawall. But as we approached Hanger 11, I heard faint noises at first, the echoes of people shouting. Then I saw the flags as we got closer, draping the small crowd ahead. There were about 30 demonstrators standing behind police barricades, waving clusters of large blue and white Israeli flags while yelling amplified slogans through loudspeakers. The line of armed police in front of them provided a zone of safety to walk by. One older man, sitting on the side holding a folded flag, asked me as we walked by “Are you a leftist?” using the term as an insult. A hundred feet ahead a steady stream of people were walking through rows of crowd control metal barriers before being stopped by darkly dressed security personnel with tiny badges pinned to their chests. Unsure where to go, or even if this was the right place, we followed the others to the hangar’s entrance and through the doors. And then I stood there astonished. Before me in the cavernous space were over a thousand people, filling the long rows of chairs, listening to the speakers who were small figures up on the distant stage and projected onto two large screens. This Yom Hazikaron gathering was organized by Combatants for Peace, an association of former Israeli soldiers and Palestinian militants who have laid down their weapons and pledged to work non-violently together to end the occupation. They gather in small groups every month, to talk and plan protests, rejecting the desire for revenge, just working for freedom and to stop the bloodshed. I have now gone many times to the West Bank with various human rights NGOs, including with Combatants. I am used to the half-empty buses, the small numbers. I had expected last night to see a hundred people, maybe a few hundred at most. But before me were throngs, young and old, listening silently to the stories and songs and prayers and hopes for peace on this day of memory. By the hugs and knowing looks between those standing with us in the back, I could sense that everyone knew someone who had died in the wars and the violence. This was personal remembrance. I could go on describing how there were both Palestinian and Israeli speakers, how the music was moving, and how the stories of loss told from the stage made one want to cry. But I think what I can do that is most appropriate on this Yom Hazikaron is to reprint the story of one of the members of Combatants for Peace. (You can read two previous narrative I posted here and here.) Although the story below is not of a former fighter, it reflects the attitudes of the former soldiers and militants in the organization – recognizing that hatred and violence will just lead to more of the same and that people on both sides of this conflict share a common humanity. Perhaps these are the most important lessons that can be taken from this day of remembering. My name is Yunes Asfoor. I don’t know how to begin my story because it is somewhat different from those of my friends [in Combatants for Peace]. After I got married, god blessed me with children. I had a son called Habib-Allah who suffered from a serious disease (leukemia). I took him for treatment in many hospitals – in the West Bank, in Jordan and in Israel — where I saw people in the same situation as Habib. While Habib was being treated in Israeli hospitals I noticed that in times of difficulty and crisis people join together against the disease. There were religious Jews there and other Israelis who would say, “May God cure your son.” What they said was heart-felt because they felt the same thing I did, their children were in similar situations. I used to say to them “May god cure your children and their disease” because I too felt what they felt, as I was dealing with Habib’s situation. I also noticed that the kids used to play with each other, nobody felt the difference of religion because they were little kids. The doctors and nurses didn’t discriminate between the Muslim, Christian and Jewish children, there was the same treatment for everyone. Today we are working together with “Combatants for Peace” to prove that everybody deserves to live in peace and justice in this country. We work together so that our children can have a better future. I say, instead of spending so much on weapons and wars, we should take care of people: spend on medicine, hospitals, education, combating illiteracy, protecting the environment. There are enough natural dangers, we don’t need to create man made ones. Whenever I see a sick child suffering pain, I feel as if it is my own child, Habib Allah, whether the child is Christian, Jewish or whatever. Based on this feeling, I work to find a better future for all the people of the world so that they can live in peace. That is why I am active in Combatants for Peace. There have been tons of articles this past week that are worth reading. I have highlighted a few below that I felt deserved special attention. 1 – Evacuating illegal settlements: Israeli newspapers have been filled with articles and commentary about impending court ordered deadlines to evacuate settlements in the West Bank that have been built on privately owned Palestinian land. Cabinet ministers are squabbling with each other, the government is scrambling for ways to delay the evacuations, and a bill has been introduced in the Knesset that would require just slightly more than a majority vote to overrule Supreme Court rulings. This would enable the government to ignore court mandates to evacuate illegal settlements. Yesterday the government ordered the army to construct emergency housing on a nearby hill for the settlers of Migron, an illegal settlement that must be evacuated by August 1st. This order is in contravention to existing laws – in other words, replacing one illegal settlement with another one. Even the Military Prosecutor’s Office objected. The government has also appointed committees to devise ways to legalize after-the-fact the approximately 100 illegal settlements in the West Bank and to avoid executing court-ordered evacuations. In contrast, coming soon on this blog is an investigative report on the demolition of thousands of Palestinian homes and businesses, which is the way that the government deals with what it considers illegal Palestinian construction. One of Beinart’s key goals is to question the narrow parameters that communal leaders attempt to impose, with some success, on American Jewish discussion of Israel. The trouble is, those narrow parameters also preclude questioning the narrow parameters. Pushback was inevitable. But that doesn’t explain the attacks’ venomous, ad hominem intensity. For that we must look to the general mood of panicked rage sweeping some segments of Israeli and American Jewry: the McCarthyite attacks in Israel on human rights organizations and the New Israel Fund, the attempts to keep J-Street speakers out of synagogues and to defund or shut down Israeli film festivals screening the wrong Israeli films. The legal threats against campus Arab student groups. The hounding of M.J. Rosenberg. It’s hard to remember such a dark mood of repression since the days of the enemies’ lists circulating in the community in the early 1980s. 3 – A short personal essay: And finally, from last week, here’s an eloquent column by Beth Miller, a young Jewish woman who is working for a human rights organization in the West Bank. 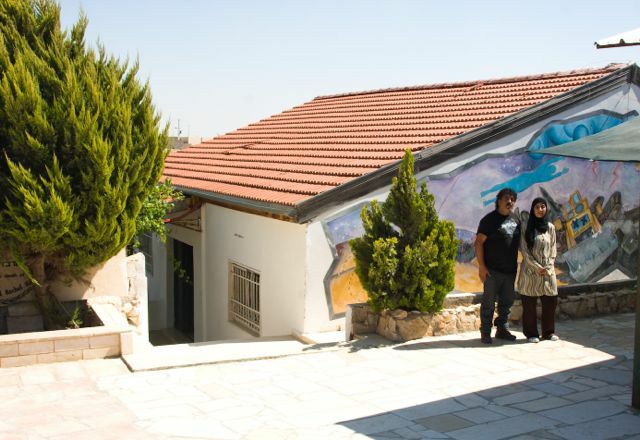 Her piece offers a small, personal window into Palestinian life. This is the second in a series highlighting the personal stories of members of Combatants for Peace, an organization of former Israeli soldiers and Palestinian militants who are committed to non-violence and ending the occupation. Two weeks ago I posted the story of Bassam Aramin, a Palestinian who was one of the co-founders of the organization. His moving story exemplifies the experience of living under Israeli rule. Today I am highlighting the story of Roni Segoly, an Israeli who spent much of his career with the police and the Shin Bet in the occupied territories. He describes how his worldview, the belief in the “absolute justice” of the Israeli occupation, began to crumble when he had the insight that the Palestinians were simply demonstrating for their freedom – and how their striving resembled his heroes in the Jewish underground who had fought the British during the mandate period. It was as if the scales fell from his eyes and he viewed the world through different glasses. Slowly Roni came to this conclusion: “You cannot rule another nation for a long period of time and there is no way to lead a humanitarian occupation. There is no way to be evil to others without letting this evil penetrate into our lives. My name is Roni and in August 2007 I joined the organization Combatants for Peace. Since then I have been an active member and this is My Personal Story. I grew up in Jerusalem in the 70s, the years of the feeling of euphoria after the Six-Day War. I was a youngster and like most of the youth my age, I joined a youth movement. The movement I joined is called Beitar, the movement of the Herut party, which later became the Likud party. I was a right-wing teen and participated in rallies, which supported the building of settlements, which had just started popping up on the hills of the West Bank, while the government shut its eyes. During that time, my belief was based on the fact that we had just freed holy lands. By chance there was a group of people living there who claimed that they were a nation. A different solution had to be found for them in the Middle East, there are 22 other Arab countries to where they can go, the absolute justice was with us. In 1975 I joined the IDF and served in an outpost in the Gaza strip. During my service, the Likud party came into power for the first time, and the feeling of my friends and I was that if we were stubborn enough, the Palestinians would give up and leave or accept our authority. We believed that there was no other way. After I finished my army service I started working for the police in the Department for Minorities in Jerusalem. For the first time I actually had to deal with Palestinians. I learned their language and customs and I remember how we used to play cat and mouse with the citizens of East Jerusalem. They would try and demonstrate their nationalism in any way possible. They would paint their cars with their flags’ colors and we would fight against any sign of nationalism with persistence and aggressiveness. Needless to say, raising of a Palestinian flag was a serious crime. In 1983 I left the police forces, and joined the Israeli secret service (Shabak), where I served until 1994 in the occupied territories in different positions where their main aim was fighting terror. If I look back on where I was then and where I am today, obviously it was a long process. I didn’t wake up one morning with a new political understanding. It was a process that started years ago, in its midst I found myself dealing with large cracks forming in the belief of the righteousness of my way, of my country, and the gap widened until I couldn’t carry on wavering on both side. I chose a way that seemed more natural to me, one that promotes peace and equality. The best way to describe the way in which change happened in me is to refer to a few points of reference in my past. During the end of the 80s’ the first uprising (‘Intifada’) broke out. This was truly a national uprising and it even took the Palestinian organizations time to figure out what was happening, to come to sense with it and to control the masses. During the first weeks the real heroes were the masses. In many places on the West Bank and the Gaza Strip the masses marched fearlessly towards the IDF. For the first time I encountered youngsters and adults that picked their heads up, their eyes were sparkling and they were filled with pride and persistence, they believed that they were creating their country, that nothing could stop them. And as for myself, I who was working in the secret service, met not with terrorists (for those people it was obvious who is good and who is bad) but with a nation that was rebelling. Suddenly I caught myself, I who in my childhood had dreamed of the Jewish underground heroes, dreamed of their fight against the British occupation, they were prepared to sacrifice themselves to be freed from being an occupied nation, and suddenly I was on the other side of this equation, and this was the first fracture that started crumbling my belief. My duty was not an easy one even if I still believed we were defending our country, and still there was a gap between the fact that you had to be evil to someone during your job, and then come home to peace and quiet, have a bath and hug your wife and kids. This gap is very difficult to deal with, but when you start doubting what you are actually doing, it becomes completely unbearable. The second point I would like to address is the house where I grew up. I was born in Baqa neighborhood in Jerusalem (this is the Arab name of the neighborhood that is used until today). I grew up in an Arab house, which to me meant a house with high ceilings, nice tiled floors and thick walls. The fact that in the past Arabs lived there didn’t occur to me at all. In 1967 right after the Six-Day War, when I was 10, a few Arabs knocked on our door, and they told us in broken English that they used to live in the house once, and they asked to see it. That was an embarrassing and strange situation, what do we do? And what do they want? I mean this house is obviously ours. Anyways we let them in, they looked around and left, and we haven’t heard from them since. I presume we weren’t very kind to them. This moment has been engraved in my memory ever since. In 2006 I went with my mother to Romania to see where my roots were. In other words, where she ran away from after the Second World War. We went to the tiny remote village where she was born. It was a deserted village in the northern part of the country and we looked for the house she used to live in. Today, obviously Romanians inhabit it since there are almost no Jews left in the area. We didn’t find the house, so we knocked on the door of a neighboring house. Someone opened and asked what we wanted? We explained and they were very unfriendly. Then I suddenly realized, this is an identical story to the one that happened in my childhood, with the original residents of the house I grew up in. Both people, Palestinian and Israeli, are connected to each other through history, and our stories are so similar that it’s nearly impossible to understand. We, children of refugees from Europe, fulfilled our dream of a Jewish state by making another nation into refugees. We, who have been a driven minority for our entire history, are ruling another nation today. The fact that our only way of ruling them is oppressing them, on the one hand and preventing them any ability for nationalism or equality on the other. How come we have changed our skin and in what manner are we managing to justify it to ourselves? This story doesn’t have good guys or bad ones, just stories that intertwine with each other. The third point of my story concerns the time I lived abroad. During the years 2000-2007 when I lived abroad, it enabled me to get a different perspective on the life in the Middle East. I found out that there are more nations that have fought one another in this world but have found peaceful ways to live together and look forward to a better future. In 2007, at a time close to my return, I saw a video clip of an opening of a sewage pipe near the settlement Efrat. In order to do so they had to uproot an olive grove of a neighboring Arab village. The inhabitants of the village appealed to the supreme court of justice but lost the case. The video showed the picture of the exact moment that the trucks entered the grove. I saw in this video two scenarios that in my opinion closed the picture of the transformation I had been going through during the last few years. The first was a picture of the Palestinian farmers standing helpless and crying, but what caught my heart was the fact that on their side were young Israelis that were hugging them and crying together with them. I didn’t know this type of solidarity. A second picture that was engraved in my head was of the soldiers that were guarding the bulldozers, walking beside them with clubs in their hands, feeling like kings. My son was supposed to go into the army the following year and the thought of it shocked me. It took me a while until I was able to tell this story. It took me time until I was able to explain to myself what was happening here. I am sure in the justice of our way, I know that I belong to a minority here in Israel, but we are determined. You cannot rule another nation for a long period of time and there is no way to lead a humanitarian occupation. There is no way to be evil to others without letting this evil penetrate into our lives. I feel that we are the true bearers of the spirit of Judaism, which means that one needs to acknowledge the right of another even if they aren’t Jewish. The Israeli policy in the occupied territories has been established and based on controlling, stealing and politically oppressing another nation. The magic word for it is “security” but all these aren’t phrases of Judaism and what my country signifies at the moment towards the Palestinian people and to a big part of the world is the ugliest side of humanity. I am not sure how most of the citizens in this country ignore the situation, and this includes some of my friends and family. How could they be more worried about the starving animals in the zoo in Gaza during the war, than the hundreds of children that were killed by us during the war? We are carrying with us the slogans of laws and security for nothing and on the West Bank, we signify the exact opposite to Judaism and Zionism. As I understand this reality, neither side (Israeli or Palestinian) will give up; we won’t go back to Europe and they won’t leave the area. We don’t have the ability to control another nation which is half of our size, it is just not possible. Not by force, not by financial repression, and not in any other manner. And there is no way that one can hold a democratic government when under its occupation you have millions of people that don’t have equal rights. The same way that in South Africa you couldn’t have a democratic government while there was apartheid. Controlling by force doesn’t just harm the occupied nation but the occupier as well. The violence penetrates back to us as our economy can’t strive forever, and all the values that we were educated on are trampled over in the occupied territories. We need to free ourselves from the occupation maybe even more than the Palestinians need to free themselves. We cannot be the “only enlightened democracy in the Middle East”, when people of a village that is only 10 minutes from where I live are prevented minimal human rights by my own country, just because of their origin. Assessments of different struggles in the world always show that it ends in negotiation and some compromise. Dezmand Tutu said “ A man is a man when he approves of others as human beings” and old Hillel said “What is hateful to you, do not do to your fellow: this is the whole Torah; the rest is the explanation; go and learn” . Sometimes people say that I have a gentle soul (we call it ‘Yefe Nefesh’ in Hebrew), even though this statement has become a derogatory statement to say that leftists are ‘Arab lovers’. I am actually proud of this term, exactly in the same manner that I see myself as an Israeli patriot. Peter Beinart’s new book, The Crisis of Zionism, is undoubtedly the most controversial, and most important, Jewish book of the year. The Times of Israel just featured on their website a review I wrote that I think you will find interesting. I highly recommend this superbly written book – what Beinart writes about is of the utmost importance to anyone who cares about Israel. If Israel does not survive as a Jewish democratic state, I want to be able to tell my children that I did what little I’m capable of. I’m a writer, so what I can do is to try to sound an alarm. I just want to be able to say that to them. His book certainly sounds the alarm in a highly informative and compelling manner. Because I think Beinart’s book is so important, I encourage you to share this post via email, Facebook or Twitter to those who might be interested. Last Friday I found myself sitting in a large room with 30 former IDF soldiers and Palestinian militants. As I looked around the room, I could imagine many of them holding guns and trying to kill each other in the past. Some just looked the part; they had the bearing, the aura, of former fighters. Yet there they were, sitting next to each other, talking, laughing, bridging cultures and ideology and hatred – and all the killing and suffering – to try to find a way to stop the fighting. This was a gathering of Combatants for Peace, an organization composed of former fighters from both sides, who have committed to laying down their arms and working towards peace. We were sitting in the local Council Building in the Palestinian village of Shufa near Tulkarm in the West Bank. The village’s access road to Tulkarm, the nearest commercial center, had been blocked by the army since 2002 and Combatants for Peace was there to help the villagers demonstrate against the barrier. The army unexpectedly had cleared the road the previous day, probably to avoid an embarrassing incident, so the gathering turned into a celebratory occasion. Perhaps the best way to convey the atmosphere in that room is to tell some of the stories of these former fighters. The Combatants for Peace website has a series of individual narratives that I hope to publish as stand alone posts in the future. More than anything I write, these narratives illustrate how hatred is engendered in both cultures, but they also show a path to overcome even our deepest animosities. The narrative posted below is from Bassam Aramin, who became involved in the Palestinian struggle as a boy growing up in Hebron. At 17, he was caught attacking Israeli troops and spent seven years in prison. In 2005, he co-founded Combatants for Peace. Since then, Bassam has not once picked up a weapon, even after his 10 year-old daughter was killed by an Israeli soldier while on her way home from school after having just purchased a candy bar. Neither the soldier nor his officers were brought to justice. His story is especially relevant for the Passover season, when Jews celebrate their freedom from oppression. Bassam describes how and why he chose to fight for his people’s freedom when he was younger, a perspective that too few Jewish people understand. The chasm between how Palestinians view their fight, and how Jews view it, is huge. Hopefully, Bassam’s narrative, and how he evolved to a non-violent struggle for his people’s freedom, can help bridge this gap.